There are many terms for various kinds of laser surgery used to improve vision including LASIK, PRK, INTRALASE, ASA, Epi-LASIK, and LASEK, all of which stand for much longer terms. Considering the confusion all of this “alphabet soup” can cause, I would like to explain what these procedures are, which ones I prefer and why. The use of the excimer laser to modify the shape of the cornea is called Laser Vision Correction (LVC), which is a generic term that includes all of the types of surgery listed above. One type, called “Surface ablation” (also known as ASA or Advanced Surface Ablation), refers to changing the shape of the cornea by applying the laser to the surface of the eye after a thin layer of surface cells (epithelium) is removed, rather than under a thicker flap of corneal tissue which is cut and pulled aside as is done in LASIK. 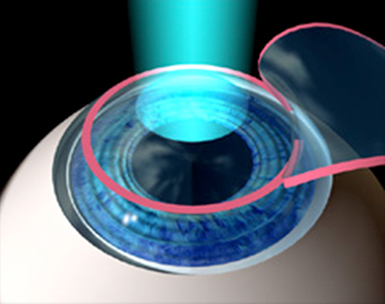 PRK stands for photorefractive keratectomy, which is a type of surface ablation. In the PRK procedure, the epithelium is gently removed allowing the underlying cornea to be exposed to and re-shaped by the laser in a brief amount of time. There are a number of methods for removing the epithelium and they all work well. After the laser is applied, the surface of the cornea is covered with a clear, soft contact lens that acts as a bandage, and several types of eye drops are put on the eye. The surface cells heal back over the cornea during the next 4 to 7 days. I have been performing surface ablation procedures since 1989, as I participated in the earliest clinical trials of the excimer laser for laser vision correction. As with other technology, a great number of improvements have been made over the last two decades, and PRK is currently being performed worldwide with outstanding visual results. The number of PRK procedures performed in the US and elsewhere diminished after the introduction of the LASIK procedure in 1996. In the last several years, due to significant advances in technology and medications that control the healing process, surface ablation techniques (PRK, ASA) are again gaining in popularity and represent about 20 to 25% of the procedures performed. LASIK stands for Laser-Assisted in-Situ Keratomileusis. 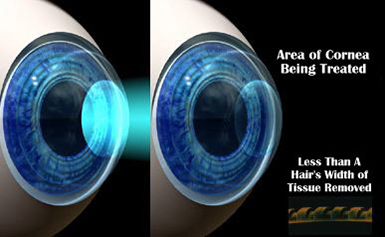 LASIK uses the same laser as PRK, the excimer cool-beam laser. A small amount of tissue beneath the surface of the cornea is vaporized to reshape the eye. If it sounds Greek--it is. Iannis Pallikarus MD, an eye surgeon on the Greek island of Crete, invented it in 1993. I travelled to Crete to observe and learn about this new procedure from Dr. Pallikarus. To perform LASIK, the surgeon uses an instrument called a mechanical microkeratome (or more recently, a specialized laser called a femtosecond laser) to cut a layer of corneal tissue, which is then folded back. Over the last 4 to 5 years, femtosecond laser has frequently been used to create a LASIK flap using a series of hundreds of thousands of small laser pulses to create a cleavage plane (“cut”) in the cornea. This procedure is sometimes called “Intralase”. The advantage of the femtosecond laser over the microkeratome includes a more precise flap that has more accurate depth and shape. As with the PRK procedure, advanced computer technology, including Wavefront technology is used to program the laser for your particular prescription. As with PRK, the laser energy pulses vaporize microscopic amounts of the cornea and reshape it after the laser pulses are finished, the corneal flap is replaced, as if closing a book. LASIK has the advantage of a quick return of vision, usually within hours, and usually minimal postoperative discomfort. The LASIK procedure is very safe but there are some complications inherent in creating the LASIK flap. Sometimes, there is an imperfect flap. Other times; the flap can have microscopic wrinkles. In a small number of cases, there can be inflammation that occurs under the flap that needs to be treated. In a small number of eyes, cells from the surface can grow under the flap and need to be removed. Almost all of these and other complications can be treated successfully however, it may involve extra medicines, doctor visits and on occasion, additional surgery. Almost all of these complications with LASIK involve problems with the flap. The only serious potential complication of PRK is infection of the cornea. It is seen in only about 1 in 500 eyes. As we follow PRK patients very closely, a PRK infection (almost always superficial) is usually treated quickly and aggressively and in most cases usually do not result in a severe visual problem although that is possible. LASIK infections are somewhat less common but more serious, as they are usually deep and can’t be treated by topical antibiotics. The PRK procedure does not have any of these flap-related problems, since there is no flap. The visual results from both procedures are excellent but recent studies have shown that Wavefront-guided PRK has a slight edge over LASIK. Wavefront- guided treatments use Wavefront measurements of the eye. These measurements, done in the office before the surgery, utilize complex technology to analyze how light travels in and how the eye refracts it. These measurements are used by the surgeon with an advanced computer program that determines the final shape of the cornea required to for that eye to see clearly, usually without refractive error. The computer, in concert with the surgeon, comes up with a program that instructs the laser on how many pulses, their size, and where they are applied and what pattern is utilized to reshape the eye. Sophisticated trackers make sure the laser beam is properly oriented on the cornea. The laser will “track” the eye and move with the eye if the eye moves. The PRK procedure is better suited to use Wavefront technology. The reason for this is explained by examining the LASIK procedure: making a flap of corneal tissue, as is always done in LASIK, creates a change in the Wavefront pattern of the eye that cannot be measured again before the laser is applied. Since all measurements using the Wavefront analyzer are made ahead of surgery, before anything is applied to the eye, one is making the assumption that the LASIK flap does not alter the Wavefront pattern. This is not the case. It is altered slightly, but that change can’t be measured during surgery, as measurements are not possible in “real time” during the actual laser procedure. The PRK procedure, however, does not significantly interfere with the Wavefront pattern of the eye, since it only requires the removal of the epithelium, which is much like peeling the outermost skin of an onion. An analogy would be the shape of the onion is not changed significantly by losing one layer of outer skin. In LASIK, a flap is cut across most of the width of the cornea, which severs all of the nerves beneath it to the surface of the eye. This means that your brain is not receiving the same amount of signals from the corneal nerves that stimulate tear production. This can cause a lack of tears and a dry eye. This side-effect can last for months. The dry eye produced with LASIK is usually better in 6 months but can persist longer for some people. Older patients and patients with pre-existing dry eye are at more risk for more or worse symptoms. The PRK procedure does not alter tear production after surface healing is complete. One of the old drawbacks of PRK was corneal haze that was seen in a small percentage of primary eyes treated with surface ablation and a much bigger percentage in eyes with previous corneal surgery. This haze was from over-aggressive healing and the production of new collagen in the corneas of some patients. The haze usually improved but could make the procedure less predictable and sometimes caused regression of the effect. An eye drop, dilute mitomycin-C, when administered for 10-30 seconds on the cornea at the time of PRK surgery, has been found to eliminate this haze. I have been using this drop regularly for over seven years on all of my PRK patients without complication and the incidence of clinically significant corneal haze is extremely low (one in one thousand). The use of mitomycin has enabled me to retreat prior PRK, LASIK or RK (radial keratotomy) patients on the surface of the eye and not be concerned about corneal haze that was common in eyes that had prior surgery. The LASIK procedure, by cutting collagen fibers in the cornea, can weaken the cornea. In some patients, a pre-existing condition in which the eye has abnormal collagen fibers can be made much worse and cause the cornea to lose its intended shape. PRK almost never causes this weakening, called ectasia. As explained above, The LASIK flap and cornea never heal back to their original strength. This flap, although sealed, can be dislodged or damaged by certain types of eye injuries. This is the reason that the US military prefers surface ablation (PRK) to LASIK for most situations and military specialties. I have been performing PRK since 1989 and now have a small number of patients from the original trials in the 1991-2 that I follow. These patients are now out over 20 years from surgery and are doing well, with good vision, no regression once healed and no apparent short or long-term ill effects on the eye. Certain complications of LASIK are more common in patients over age 40. The surface cells are not as tightly bound in people of that age and can slough off unexpectedly during a LASIK procedure, which can cause complications. With PRK, the surface cells are deliberately removed and grow back under controlled conditions and there is no flap for them to grow under. Dry eye is more common in older patients and, as explained above, can be aggravated by LASIK. Why is LASIK advertised by the “chain” surgery centers and there is no mention of PRK? LASIK is somewhat less expensive to perform and both eyes are usually done at the same session. It requires less expensive eye drops and does not need as much follow-up. The “chains” do not usually have the manpower to do the close follow-up of PRK patients and discourage or do not offer the procedure. The early return of vision in LASIK patients helps with their marketing, which portrays the surgery as “quick and easy”. A postop regimen that I participated in developing is very successful in controlling postoperative discomfort or pain and is used by most surgeons. Most patients complain about a foreign body sensation, like an eyelash in the eye or a “bad contact lens day” and watering in the operative eye for a few days. There is rarely significant pain and when it is encountered, the discomfort is almost always the result of a dislodged or poorly fitting bandage contact lens, which can be replaced.